Largehearted Boy: Book Notes - Kelly Kerney "Hard Red Spring"
Book Notes - Kelly Kerney "Hard Red Spring"
Kelly Kerney skillfully spans almost one hundred years of American intervention in Guatemala in her compelling novel Hard Red Spring. "A multigenerational, multi-viewpoint tale that’s a meditation on everything from history to cultural context to personal strife, Kelly Kerney's second novel is an adept meditation on the weight of history." Hard Red Spring is a novel that explores the bizarre and tragic history of American intervention in Guatemala. Covering a century of slavery, popular revolution, civil war, genocide, and reconciliation, the narrative follows four American women: a farm girl in 1902, the wife of the American ambassador at the height of the Cold War, an evangelical missionary in 1983, and the mother of an adopted Mayan daughter in 1999. The book is an epic tragedy that has always defied my attempts to easily summarize it. I think I'd do better to discuss it through my track notes below. But to understand the various and vital ways that music influenced this project, readers should first know something about me: I grew up in a very strict Pentecostal home, where secular music was not allowed. When I rebelled and fled for college, I'd never listened to Neil Young or Bob Dylan, and had never even heard of Billie Holiday, Bob Marley, Vivaldi, or John Coltrane. Since then, in a perpetual effort to make up for 18 years of deprivation, there has rarely been an evening when I am not at home just listening to records. With that, my musical memories of this novel's synthesis are so diverse—ranging from disturbing 1930s Chiquita jingles to drowning my sorrows with Junior Kimbrough to bad, sexually explicit Uruguayan pop. But, for the sake of your enjoyment and the mix itself—I take mixes very seriously!—I will stick to relevant songs that I actually enjoyed. Hard Red Spring was based on many years of research. To grasp this history, I needed context that reached beyond even a hundred years. With that, I delved back to Spanish rule. I leapt forward to study CAFTA and the immigration crisis. I even found myself studying the Mayan Empire. All these eras cast light on each other—into the past, into the future—informing the narrative in surprising ways. History repeats itself. As you'll see in this mix, I love repetition, how a refrain evolves or refuses to evolve, becoming sly or insistent—much like the themes of the book reverberating over a century. As the Spanish Conquest echoed in the doings of the Cold Warriors, I could not help but think of this song. Every time the American ambassador in Part 2 walked into a scene, I heard the opening verse: He came dancing across the water/ with his galleons and guns/ looking for the new world/ in the palace in the sun. After listening to Animals every time I got into a jam for seven years, I have to admit I got just a tiny bit tired of it. But there was no other album that could fuel my marathon restructurings. Thank God for Steve Gunn. In 2013, I discovered his album Time Off. Gunn's cyclical style latched onto some crazy dormant receptors in my brain and helped me recapture the deep meditative groove I needed to finish the book. Much like a record on a turntable, these melodies pushed my thoughts around and around, gaining just a tiny bit of distance with each revolution. As for "Lurker," I often felt like a lurker outside of this history. Why would a defunct Pentecostal from the Midwest care about Guatemala? Who was I to try to give insight into this perverse history? Sitting in bed and sipping my fair trade coffee while reading reports on torture and genocide, I often questioned myself. The chorus says it all: That no one sees the crime/ That no one sees the crime/ That no one sees the crime. America's brutal interference in Guatemala continued for so long—captured in this song's relentless drone—because our involvement was so well-hidden: United Fruit's stranglehold on the country touted as economic development, the CIA-orchestrated coup masked as a popular counter-revolution, covert funding of military dictators, psychological reeducation of the population via missionaries, the forced resettlement of Mayan ethnic minorities under the guise of aid, impunity packaged as reconciliation. Two of the four female protagonists become unwittingly, deeply involved in these invisible crimes along with their husbands: That no one sees the crime/but my true love and I.
I played this song to commemorate my fifth year of working on the novel—both a high and low point. Years of research had crammed by head so full of facts, ideas, characters, symbols, scenes, and dialogue that the first draft had grown to an unwieldy 800 pages. But, I had a draft: My brain hurt like a warehouse/ it had no room to spare/ I had to cram so many things/ to store everything in there. I was both hopeful and despairing. The lyrics (about the doomed state of the world) are so sad, much like my subject. Yet Bowie is belting them out, refusing to just roll over quietly. Every protagonist in Hard Red Spring will have a swan song and this is Evie's. Evie, the protagonist in Part 1, is eight years old. Living on a farm in rural Guatemala in 1902, she struggles to make sense of the dangers all around—both real and imagined: volcanoes, snakes, ghosts, criminals, government officials, and inscrutable natives. Phrases her parents use light-heartedly terrify her. One of these phrases is “keeping the wolves from the door.” As her family's financial situation becomes increasingly desperate, her father embarks on riskier and riskier maneuvers to keep them in Guatemala. Eventually, Evie comes to distrust even her parents' motivations: This is how it was meant to be/ I was meant to go on hoping/ even though there's really no hope/ in this land or on the sea/ becoming familiar with an illusion… The elastic, manic swings of the singer's voice remind me of a child fitfully protesting an injustice. From the hills of West Virginia, Mamaw (real name Ella Hanshaw) is my maternal grandmother. She was also the lead singer and songwriter in a gospel group called The Hallelujah Hill Quartet. She recently described her songwriting process to me. The Holy Spirit would enter her, she said, and she'd “lose time.” Hours would pass like seconds and she'd snap out of it with a song. Amazingly, this sounded much like my own writing process where I'd fall into a (sober!) trance for hours at a time—though I do not call it the Holy Spirit. Upon hearing this, I knew where I had come from for the first time in my life. One More Hill is Lenore's swan song. The protagonist of Part 3, she is an evangelical missionary in Guatemala. Undoubtedly a sheep, she fully believes in the military dictator's plan to baptize the entire nation in the middle of a raging civil war. All of my protagonists are well-meaning. I thought of Mamaw often while writing Lenore. Empathy was vital in developing all of my characters beyond their crude dog/pig/sheep designation. That's just theme and I was careful not to mistake theme for character. Will Oldham's music is like pure emotion. Half the time I suspect that my strong, instinctual reactions to his songs are far off from his intentions. But I've stopped caring. As I hear it, this is Jean's swan song. Jean, the protagonist of Part 4, has invested her entire emotional life in her adopted Mayan teenager, who is growing remote, rebellious, and physically volatile. Rejected and haunted by maternal guilt, she latches onto a woman whose passion, daring, and independence she wishes to make her own. As Jean blazes a tourist route through Guatemala accompanied by her daughter and shadowed by this lover, the U.N. Truth Commission picks up the pieces of a 36-year civil war just recently ended. In this, I hear Jean's loneliness, longing, and liberal guilt. I hear the fear and wonder that come with loving two people she tries to but cannot understand. This is Dorie's swan song. The wife of the American ambassador to Guatemala in 1954, she becomes involved in a love affair that she believes will lead to a new life. But slowly her lover begins to distance himself from her. Over the course of Part 2, she becomes increasingly drunk, desperate, and delusional about their relationship—reflected here in the building desperation of the singer's voice. The pleading and screeching declarations sung to the instrumental hammering perfectly encompasses her helplessness against the deafening Cold War rhythm that dominates her life. In the streets, a seething populist revolution is being realized while the anti-communist alarm blares in her home. All she can do is try to sing over the clamor. Here come the dogs! There are many dogs in Hard Red Spring: dictators, military personnel, and hired goons who keep Guatemala in a state of terror. They are trained, funded, and propped up by the pigs. But the dogs have their story, too and I would be a poor novelist if I did not explore them as individuals. The pigs, too. To truly understand how the Guatemalan tragedy happened, we need to understand their perspectives as well and maybe at times even empathize with them. 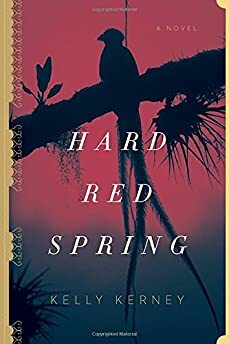 In Hard Red Spring, a United Fruit executive has reinvented himself from enslavement; a peasant must kill or be killed; an illiterate solider is raised up to lead his country; a plantation owner loses everything to land redistribution; a broken boy soldier becomes a televangelist. Waters, in the closing verses, sums up the dog's lot: who was born in a house full of pain/ who was trained not to spit in the fan/ who was told what to do by the man/ who was broken by trained personnel/ who was fitted with collar and chain/ who was given a pat on the back/ who was only a stranger at home/ who was ground down in the end/ who was found dead on the phone/ who was dragged down by the stone. Lenore is the only character to get two swan songs since she is the only protagonist to resurface in another section. In Part 3, she believes she is doing God's work as a missionary. When she reappears in Part 4, however, she is greatly changed. Indeed, she gets another swan song because her old self has died and she's been reborn. She is the only character who gains true perspective on her deeds. Callahan's simple repetition of It's time to put God away is like the voice of reason. Every time he says it, the suggestion gains a little more weight. Overcome with guilt, Lenore herself is stuck in a loop, obsessively transcribing the stories of the genocide's survivors into notebooks that fill her dilapidated shack. Callahan's voice is so clear, so calm and measured, like the voice of God Himself, disavowing Himself and what has been done in His name.